We are a one-stop bridal shop that offers many different bridal services which will save you a lot of hassle, time and money. Since we provide more than dresses, you'll find that choosing us is the best way to access wedding invitations, wedding favours, wedding décor and wedding cakes, plus so much more! You can watch a video about services we provide by clicking here. 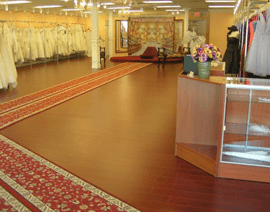 We are one of the most highly-recommended, locally-owned bridal salons in Canada. Thousands of brides have entrusted their wedding experiences to our store and many of the brides-to-be who buy from us have been referred by one of their friends (who also had a great experience at our store). You can read here what real-life brides-to-be are saying about us: Read Testimonials. Bridesmaids can be hard to please. When you choose your bridesmaid's dresses at our boutique, you'll be able to select from a gorgeous and comprehensive palette of shades, which will make it so much easier to fulfill your bridesmaid's wishes and expectations. We will beat any price you find in any authorised retail store in Canada by 10% of the difference. Click here to read more. Get Your Money Back with our Exciting Referral Program! Get back every penny of the money that you've spent and more on your dress by participating in our Easy Referral Program. If you're a budget-conscious bride-to-be, you need to know that we do offer the most impressive, sale-priced designer wedding dresses. In our Clearance Department, we are proud and pleased to offer famous, designer-brand bridal dresses, which retail from just $99! One of these dresses may just be the affordable dress of your dreams! Your wedding day matters so much to all of us, and we want to take the pressure off of your shoulders. This is why we offer customer service that is designed to help you enjoy the most romantic and enjoyable day of your life. When you choose our company, we'll take care of the hard work for you, so as to ensure that you are able to get the most from your nuptials! With our huge selection of hundreds of gowns in sizes 0-36, you'll be able to try on your gown in your size. Shopping at our store is the same as going to 10-15 other smaller stores which don't provide the extensive inventory that we do. We are an authorized retailer of authentic, designer wedding gowns. Our caring and experienced bridal gown specialists will be at your side, giving you the guidance and help that you need. We provide the sort of world-class customer service that is so hard to find these days. 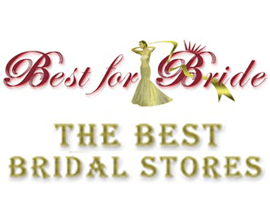 At Best for Bride, we want you to enjoy shopping for the dress of your dreams. We are there to take the stress and guesswork out of the process, and we will treat you like a queen as you explore all of the options. 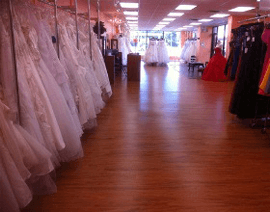 Why be overcharged when you say "Yes To The Dress"? When you select Best for Bride, you'll access the world's most exclusive and glorious designer gowns, without experiencing "sticker shock". Our dresses are just so Competitively-Priced, and that's why you'll get Superior value by purchasing your favorite dress at one of our stores, or via our convenient, online wedding boutique. If you choose us, you'll receive Exclusive Coupons which are available only to our valued clientele. These coupons will allow you to save BIG money on wedding accessories, bridesmaid's dresses and other wedding attire. Check our Special Offers. Our caring bridal specialists will go the extra mile in order to offer you a great deal, by providing you with access to truly amazing introductory offers on accessory packages which will save you hundreds of dollars. For example, How to Save $338 on Your Wedding Dress and Accessories. Plus size brides are beautiful, curvy and feminine. At Best for Bride, we cater to these lovely ladies by offering a truly exceptional assortment of flattering and affordable bridal dresses. If you're plus size, you'll find that we have the sort of exquisite wedding gown that you've always dreamed of wearing. Find out more by watching our video Tips for Plus Size Brides. You will get an unbelievable array of coupons and special pricing offers, which are reserved only for our brides. This list alone is usually worth more than what you'll spend on your dress. At Best for Bride, you won't experience "hard sell". In other words, we won't be pressuring you to make a decision before you're ready. We will be patient, caring and supportive as you decide on the perfect gown. 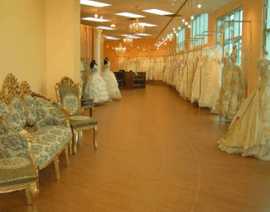 We don't believe in high-pressure selling, although many other bridal boutiques do believe in this selling technique. So, you'll find that shopping with us is much more pleasant and relaxing. Our wedding dresses are the real thing. In other words, they are not "knock-offs", so you'll never have to wear a cheap replica of an original design. If you want true designer quality, you'll find that we deliver. We are an authorized retail store and we provide the ultimate in authentic quality to every beautiful bride-to-be. We are the only store that offers 17 additional benefits that you won't find at any other bridal salon in Canada.